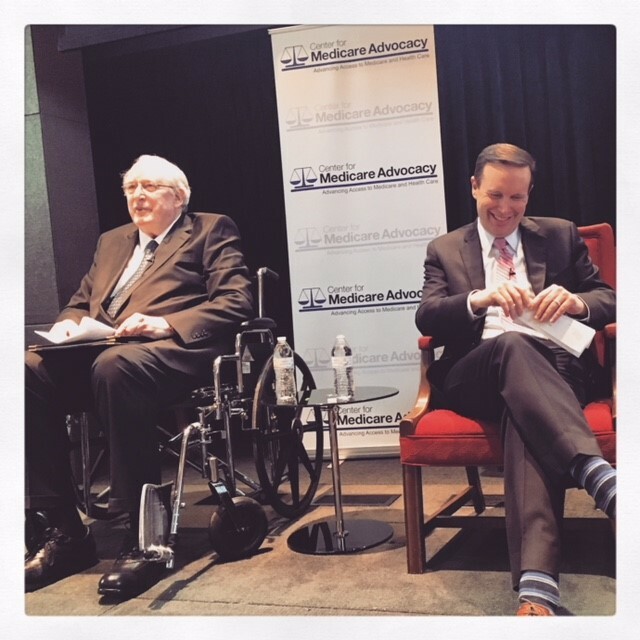 On March 22, 2018, the Center for Medicare Advocacy held its fifth annual National Voices of Medicare Summit and Senator Jay Rockefeller Lecture at the Kaiser Family Foundation in Washington, DC. 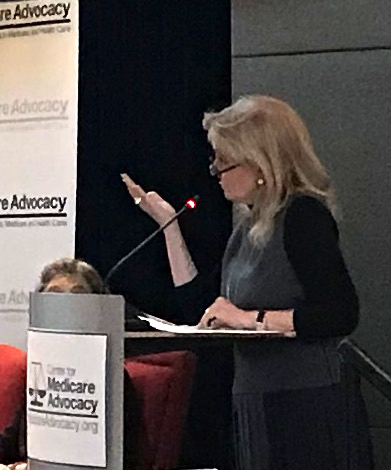 The Summit convened advocates and leading experts to reflect on challenges and attacks on the Affordable Care Act, Medicaid and Medicare, and to explore current developments and the future health care landscape for older people and people with disabilities. Medicare Framework: Tricia Neuman from Kaiser Family Foundation (KFF) framed the discussion of the day with some important Medicare statistics. She cited KFF studies that found that more than 50% of Medicare beneficiaries have incomes of less than $26,200 with assets less than $74,450. She also listed the current gaps in Medicare, including the lack of a meaningful long-term care benefit, no out of pocket cap for Medicare Parts A and B, and the lack of dental, audiology and vision coverage. Neuman also cited research that projects that from 2013 to 2030 health care costs will rise from 41% to 50% of an average person’s Social Security income. Now What: The Affordable Care Act, Medicare and Medicaid: Moderated by Sean Cavanaugh, former CMS Medicare Director, this panel explored the future of the Affordable Care Act, Medicare and Medicaid in the current political climate. Nancy-Ann DeParle, from Consonance Capital Partners and formerly CMS Administrator and White House Healthcare Director, Chris Jennings, from Jennings Policy Strategies, and Kate McEvoy, Vice President of the National Association of State Medicaid Directors, shared their experiences and insights with the audience on a broad range of health care issues. The conversation included a discussion of the meaning of value in “value-based” health care approaches, the future of the Money Follows the Person program, the importance of the Medicare-Medicaid Coordination Office in facilitating care for the diverse dually eligible population, prescription drug pricing, and various proposals to expand Medicare enrollment eligibility. DeParle cautioned that discussions regarding expanding Medicare enrollment eligibility must be conducted in tandem with discussions on how to improve the current structure of Medicare to address the existing gaps in coverage for beneficiaries. The panel also addressed the threats to the ACA, Medicare and Medicaid that continue to persist despite recent successes in thwarting major restructuring or the complete elimination of these programs. Civic Engagement: Advancing Access to Health Care: This hopeful panel moderated by Max Richtman, from National Committee to Preserve Social Security and Medicare, contextualized grass roots advocacy within the framework of the recent fight to save Medicaid, Medicare and the ACA. Khelan Bhatia from AARP, Topher Spiro from the Center for American Progress, Ilene Stein from SEIU, and Ben Wikler from MoveOn.org energized the crowd at the Summit with their recounting of the crucial role advocacy groups and beneficiaries played in successfully blocking the recent legislative attempts to destroy the healthcare system. In reflecting on a year in which health care coverage was challenged as never before, these experts and visionaries analyzed the year’s successes and focused on the continued goal of protecting essential health programs while building on the existing programs to improve access to affordable, quality care. Wikler cautioned that future attempts to decimate bedrock social insurance programs will likely persist, so he stressed the need to continue the important work of providing a voice for those who are often silenced. 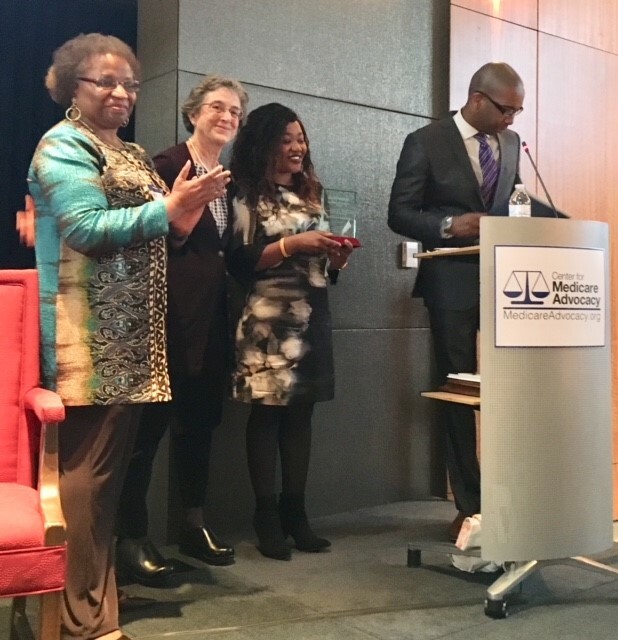 Alfred J, Chiplin, Jr. Social Justice and Advocacy Award: The second annual Chiplin award was presented to Josephine Kalipeni from Caring Across Generations to honor her commitment to social justice and dedication to caregiver and health care rights. Kalipeni gave an inspirational speech where she emphasized that when striving to find solutions to problems of populations of people, it is essential to look to those affected, stating that “people closest to the problem are closest to the solution.” She spoke of the opportunities she has been given in her life to make a difference, and called on the advocates and change makers in the audience to also expand their networks and invite diverse groups into their conversations seeking policy solutions. The inaugural Award recipient, Ben F. Belton, formerly from the Social Security Administration, presented the 2018 award to Kalipeni. In his introductory remarks Belton welcomed Kalipeni as “a voice for the least among us.” Quoting Martin Luther King, Jr., Belton said “let us be those creative dissenters who will call our beloved nation to a higher destiny. To a new plateau of compassion, to a more noble expression of humanness.” The Center was honored to have several members of the Chiplin family in attendance at the award ceremony. For decades, Alfred J. Chiplin, Jr. (Chip) was a beloved and admired leader in the elder law, disability and health care rights communities. To honor Chip’s long-term advocacy and commitment to civility and justice for all members of society, the Center for Medicare Advocacy established an award in his honor in 2017. The Alfred J. Chiplin, Jr., Social Justice & Advocacy Award, is given annually to an individual who works to advance civility in society and social justice for all – as Chip did for decades. Josie Kalipeni will no doubt bring honor to Chip’s legacy of compassionate, determined advocacy as Ben Belton has done in his continued work to support older people and people with disabilities. Senator Jay Rockefeller Lecture Award: The Center was honored to recognize Sen. Chris Murphy (D-CT) and his extraordinary leadership in advancing access to affordable health care and justice for all. Sen. Jay Rockefeller was at the Summit to introduce Sen. Murphy and provide comments regarding health care and the power of advocacy in the effort to block the devastating ACA repeal bill. Sen. Murphy stressed the importance of health care to his constituents, and Americans broadly, as he recalled that access to affordable, quality health care is the one of the top issues that people cite when indicating what matters most to them and their families. Also joining Sens. Rockefeller and Murphy was 2015 Senator Jay Rockefeller Lecture honoree Judy Feder, from the McCourt School of Public Policy, Georgetown University for a discussion about the future of Medicare and health care. 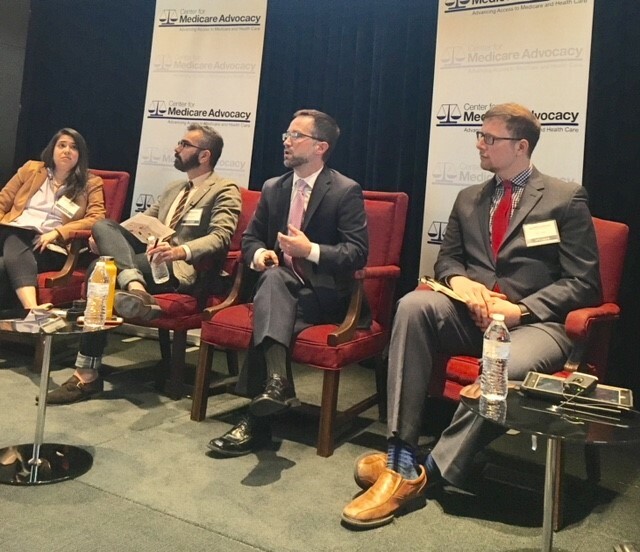 Wait, Wait, Don’t Tell Me: Health Care Hot Topics: To close out another enlightening and energizing Summit, Center attorneys were joined by three colleagues for a fast-paced game show style education session on trends and developments in health care. Led by Center Executive Director Judith Stein, Kathy Holt, Wey-Wey Kwok and David Lipschutz, attorneys at the Center, were joined by Kevin Prindiville, from Justice in Aging, Julie Carter, from Medicare Rights Center and Carol Regan, from Community Catalyst. A special thank you to the audience for robust and spirited participation – and to the (real) Wait, Wait show for the prizes! 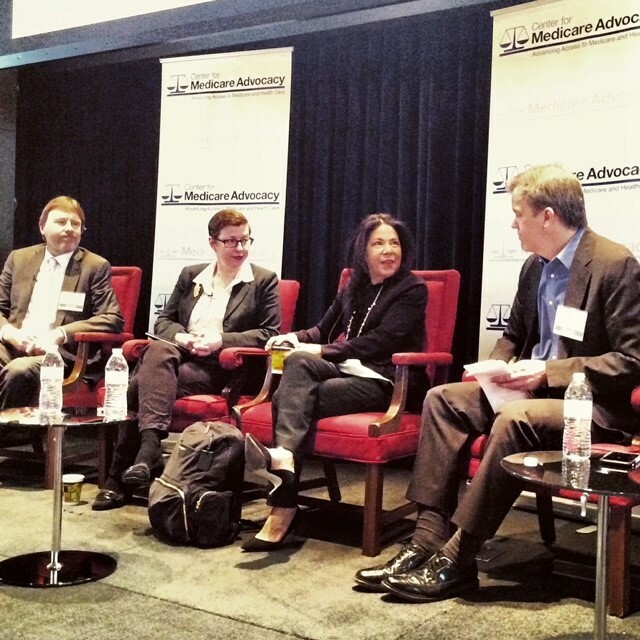 The Center for Medicare Advocacy thanks all of our attendees, sponsors, panelists and presenters. Your participation makes the National Voices of Medicare Summit & Sen. Jay Rockefeller Lecture a remarkable event. We look forward to further exploration together next year. Stay tuned for next year's date! Moderated by Sean Cavanaugh, former CMS Medicare Director, this panel explores the future of the Affordable Care Act, Medicare and Medicaid in the current political climate. Nancy-Ann DeParle, from Consonance Capital Partners and formerly CMS Administrator and White House Healthcare Director, Chris Jennings, from Jennings Policy Strategies, and Kate McEvoy, Vice President of the National Association of State Medicaid Directors, share their experiences and insights with the audience on a broad range of health care issues.